Your bathroom takes a lot of use over the years. Like all of us, it needs a bit of tender love and care from time to time. Of course, you clean it regularly, but bacteria and dirt builds-up on the tiles and grout, leaving some very unsightly stains. How do you keep on top of the grout cleaning? Is there a schedule to follow or do you need to up your game? At the Grout Medic, we get asked about bathroom cleaning all the time. We’ve put our heads together and come up with the following six ways to keep your bathroom in the best possible shape. The bathroom grout absorbs the dirt, product, and moisture from the air, as well as the unwashed feet of the family. Over time the warm, damp conditions in the bathroom encourage the growth of bacteria in the grout. The black surface is the visible result. Steam is the only way to get the dirt out of the porous grout. The Grout Medic technicians will have your grout looking new again and free of chemicals and bacteria. Like broken tiles, chipped or missing grout will let water through to the areas below. Water seeping in over time does a lot of damage, the sort of damage you may not see until it is too late. Early intervention is the cure here and grout repair is an essential, regular task. Our professionals will replace the missing and loose grout and prevent the trouble from getting out of hand. We can do the work in a minimal amount of time and match any color scheme you have in the bathroom. After cleaning the grout and doing any grout repair, you will need to seal it. Otherwise, the bacteria will get a hold again, building up the black surface in a very short time. The key is grout sealing, protecting the grout and allowing the dirt and moisture to wash away. Grout sealing will also make it easier for you to clean the bathroom. The dirt will wipe away with a cloth and a mild household cleaner. This is one many people forget to do, or don’t do enough. You will need to get into the bathroom at least once a week and get down on your hands and knees. 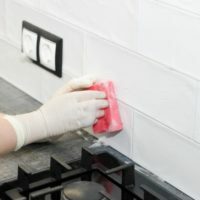 Wipe all the tile surfaces clean and do the grout cleaning between the tiles. If you schedule the job you will soon get in the habit. Pick a day and stick to it. A yearly visit from the Grout Medic will help keep you on top of the work. Check our list of services to see what we can do for you. Tile cleaning is one of our services. The same steam technology we use on the grout cleaning lifts the dirt off your tiles. They will shine again and cleaning them yourself in the future will become so much easier. Your tiles get a lot of surface contact, so take care of them to keep the bathroom looking clean. Tile repair and tile replacement are two other services we offer which can save you a lot of money in the long-term. Broken tiles not only look bad, but they can let water in under them, leading to serious structural damage to the home. Don’t wait until the bathroom begins to smell or the kids tell you to do something about it. Grout problems can build up over many years and you may not even notice them happening. Our professional technicians will do the grout repair, the grout cleaning and the grout sealing, along with any other service you may need.